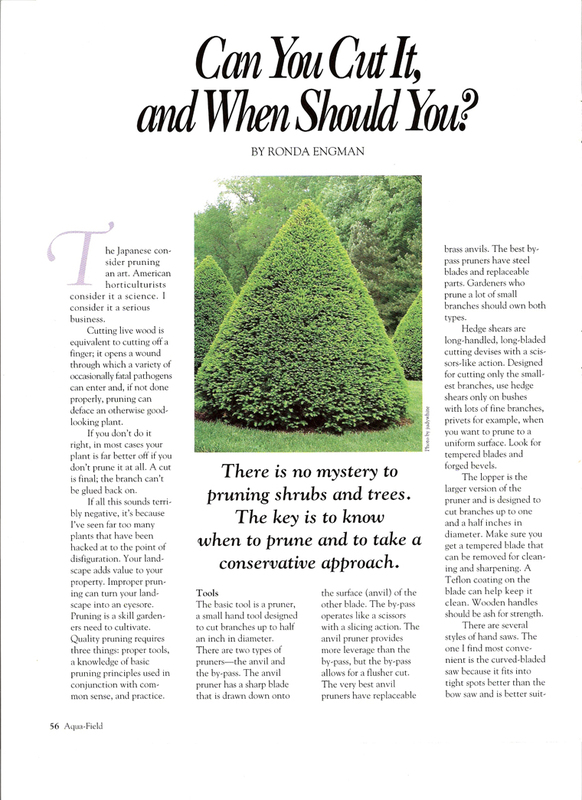 I work only on assignment and would be happy to discuss article ideas with editors. I hold the rights to all articles below and would be happy to discuss reprint rights with editors. 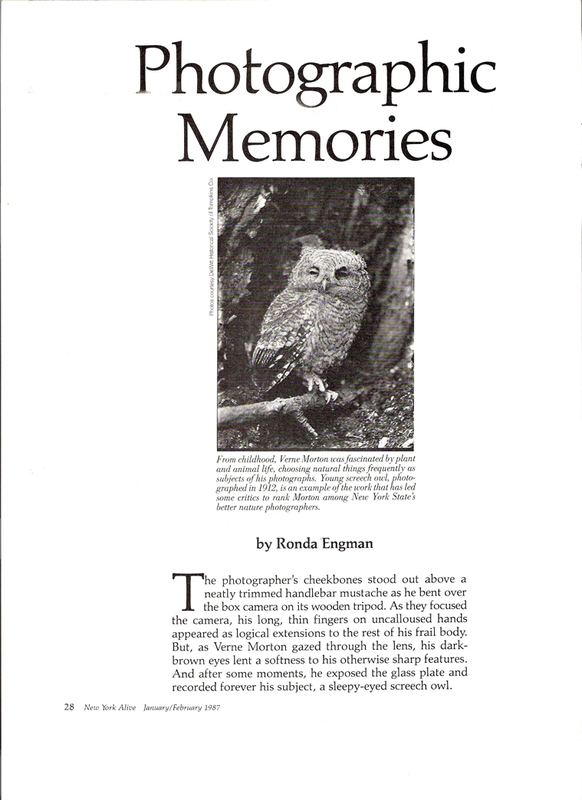 Bird Watcher's Digest, July/August 1982. "Keeping Track of the Great Blues." 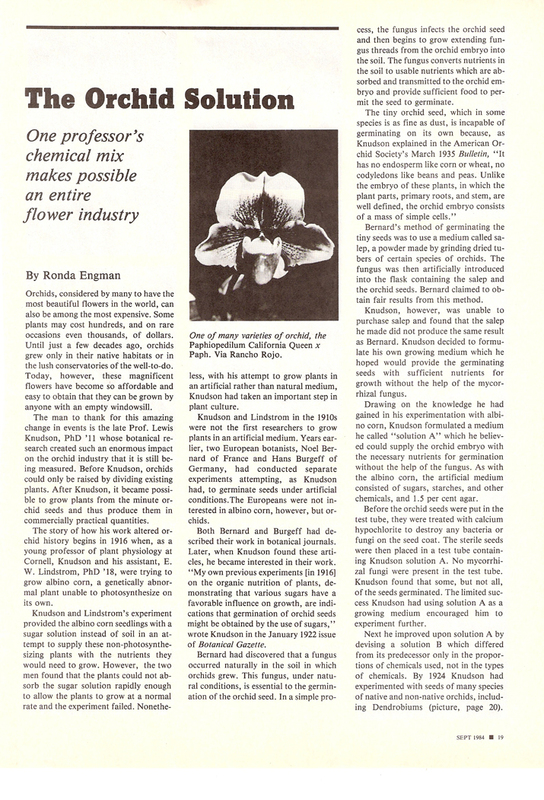 Organic Gardening, January 1985. "Living with Chipmunks." 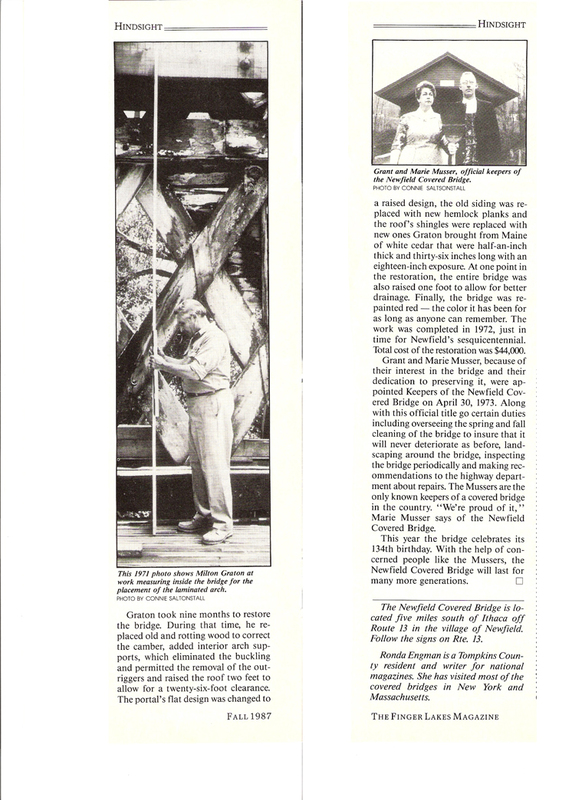 Cornell Alumni News, November 1991. 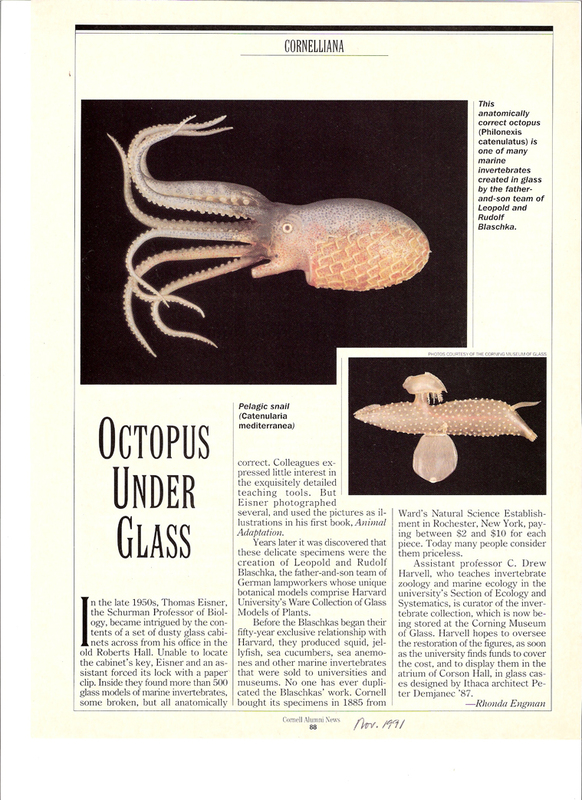 "Octopus Under Glass" (Leopold and Rudolf Blaschka). 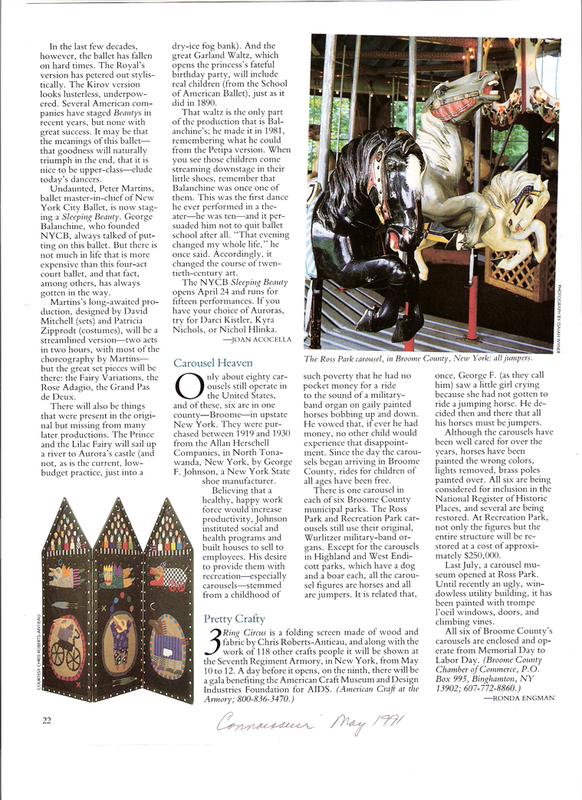 Connoisseur, July 1991. 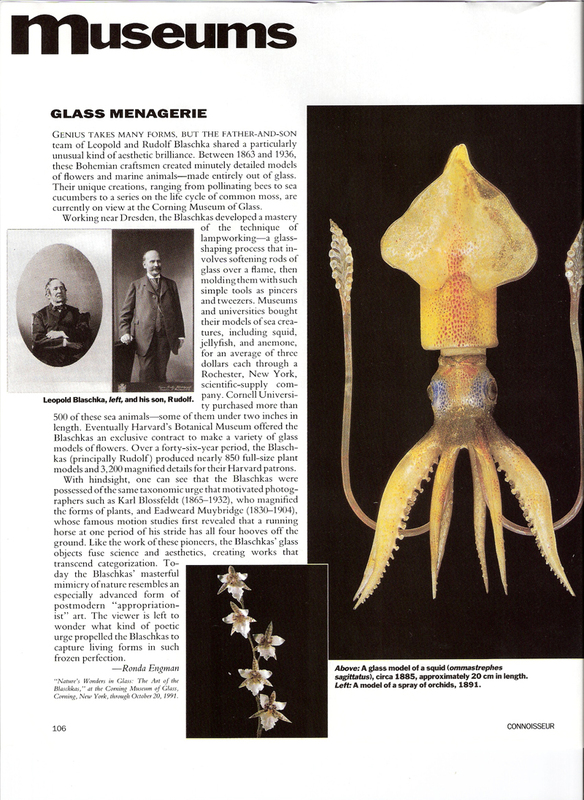 "Glass Menagerie" (Leopold and Rudolf Blaschka). 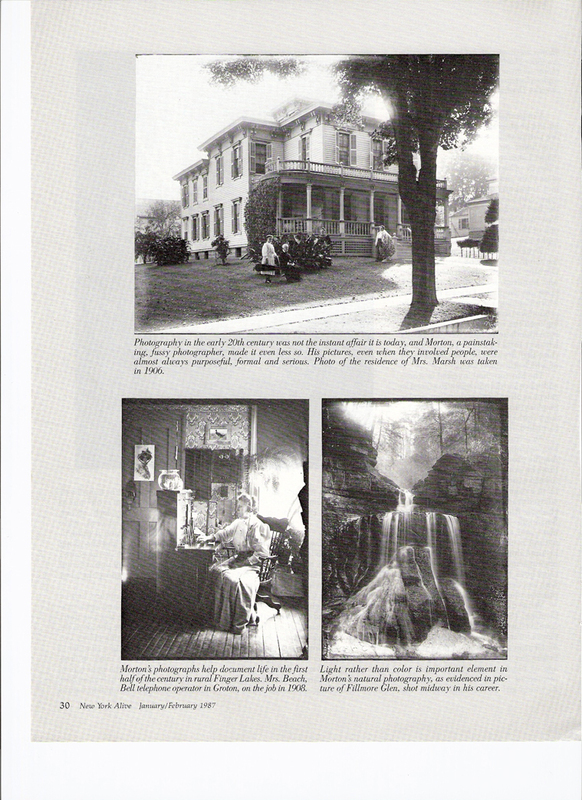 Finger Lakes Magazine, Spring 1987. "Johnny Hart, The Prehistoric Funny Man." 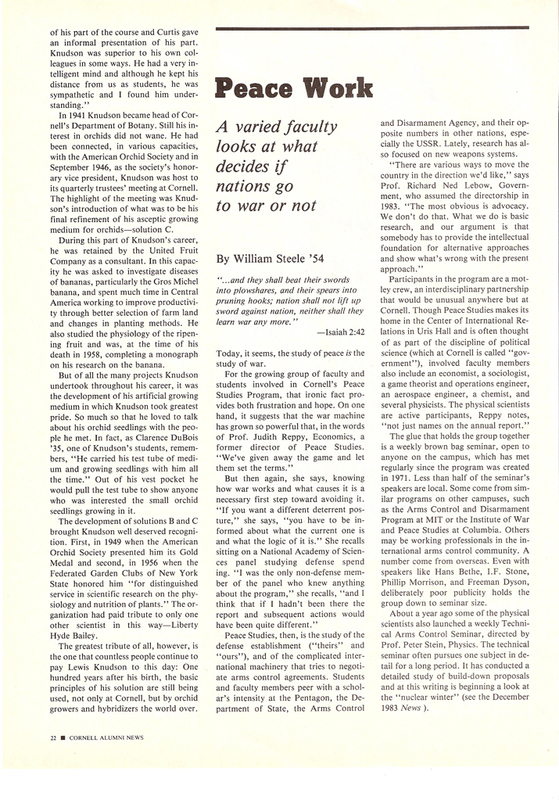 Cornell Alumni News, November 1986. "The Art of Daylilies" (Andre Viette). 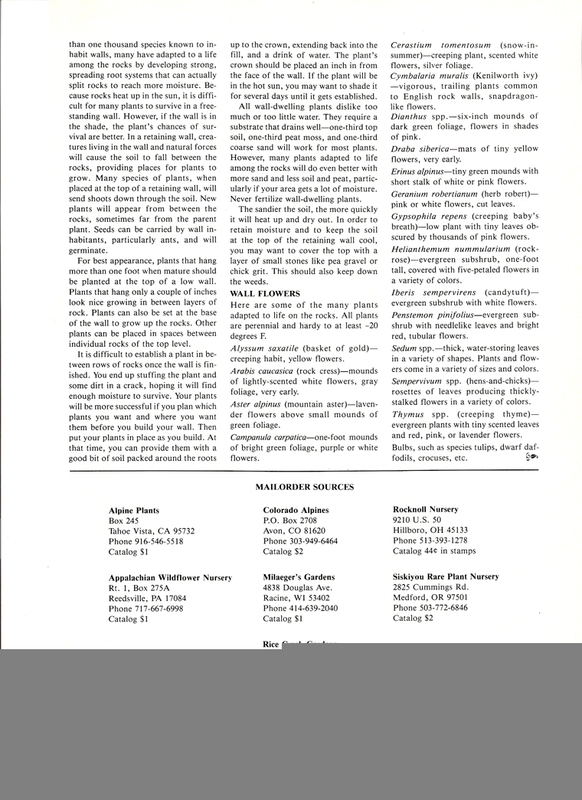 Random Harvest Magazine, August 1981. "A Stone Mason Blends Art with Nature" (Mike Mastroberti). Schenectady Gazette, March 5, 1988. 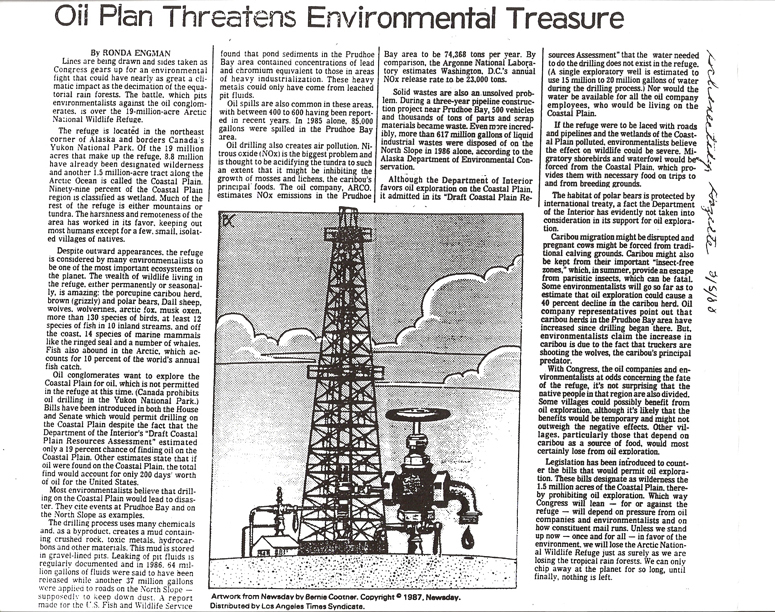 "Oil Plan Threatens Environmental Treasure." 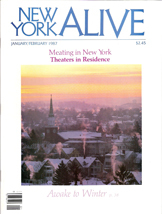 New York Alive, March/April 1989. "Four-Star Feast." 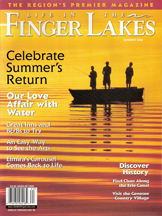 Life in the Finger Lakes, Summer 2006. "The Rural Pond." 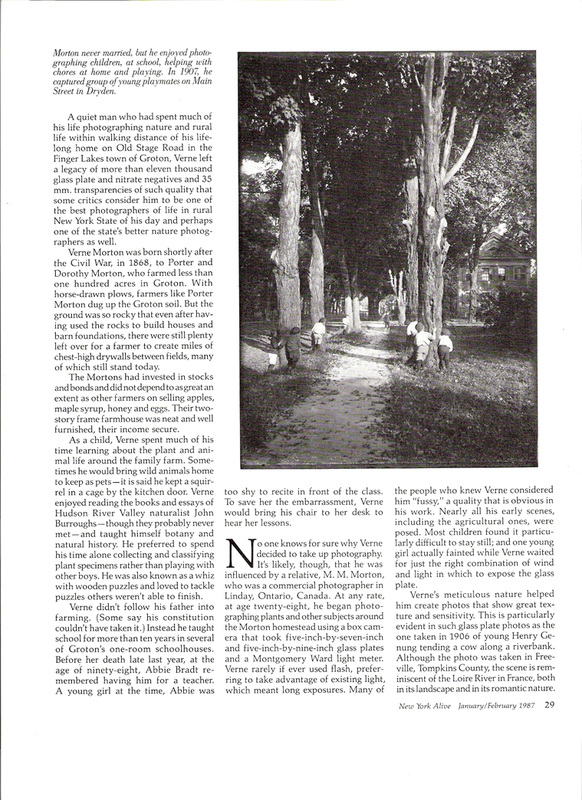 Connoisseur, June 1989. "Small Is Beautiful" (miniature roses). 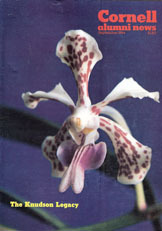 Connoisseur, March 1989. "The Last Peony." 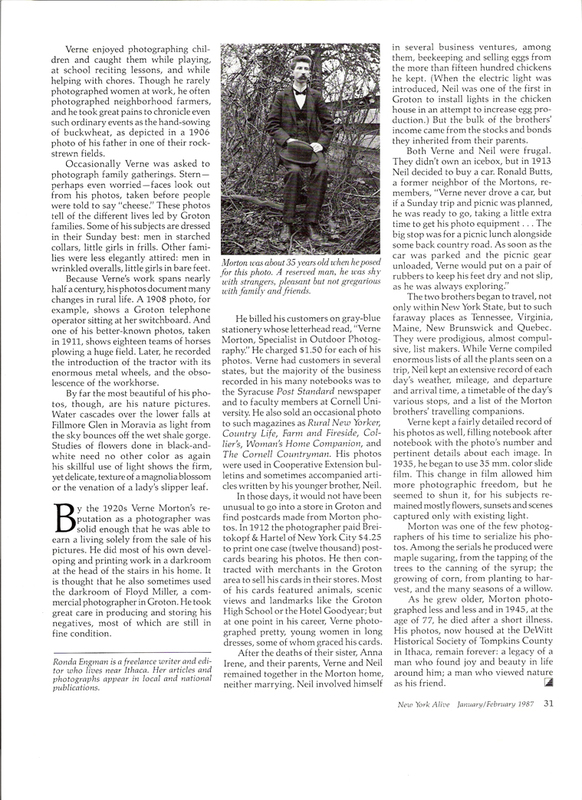 Grapevine, September 29-October 5, 1988. 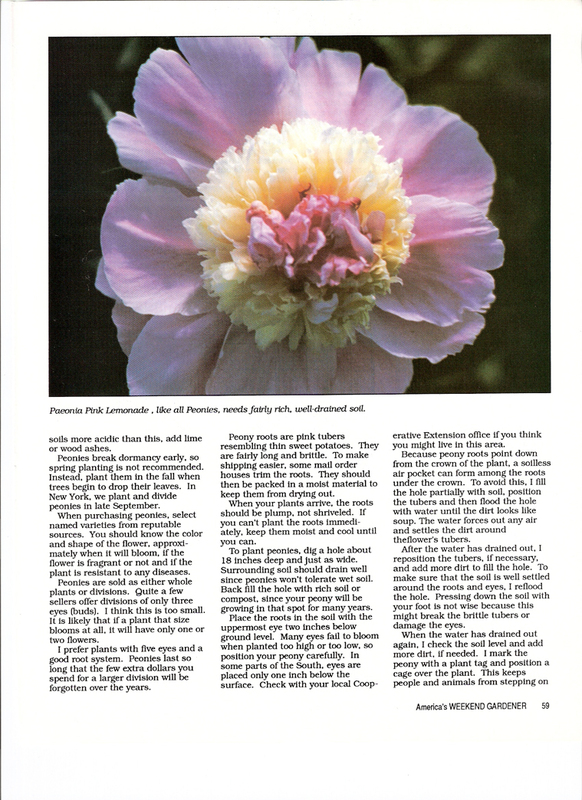 "Peony Primer." 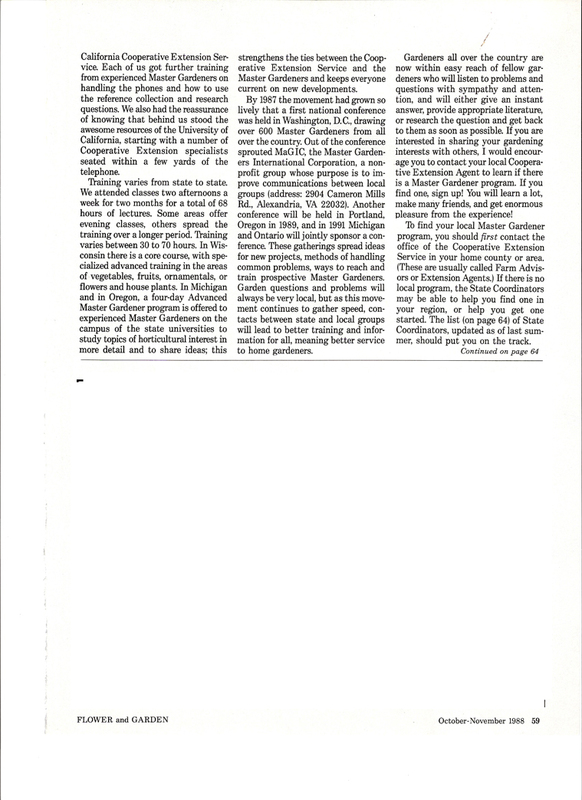 The New York Times, August 7, 1988. 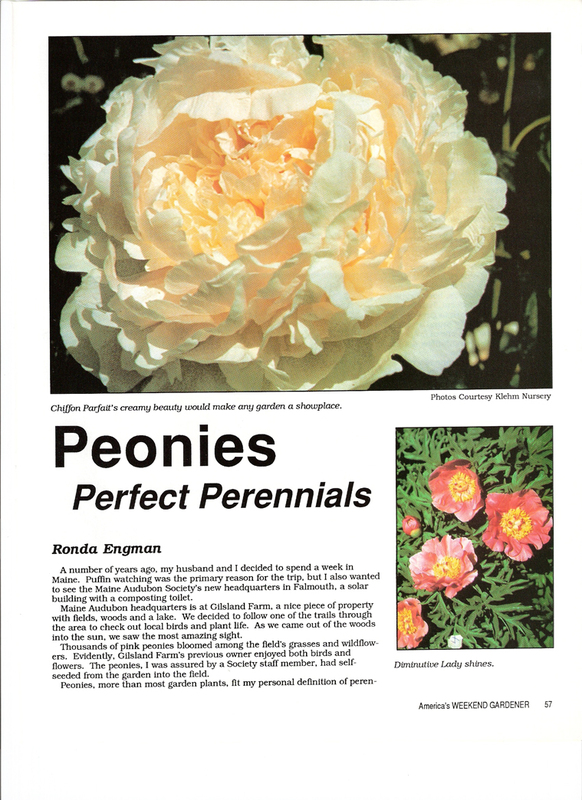 "Time to Order Tree Peonies." 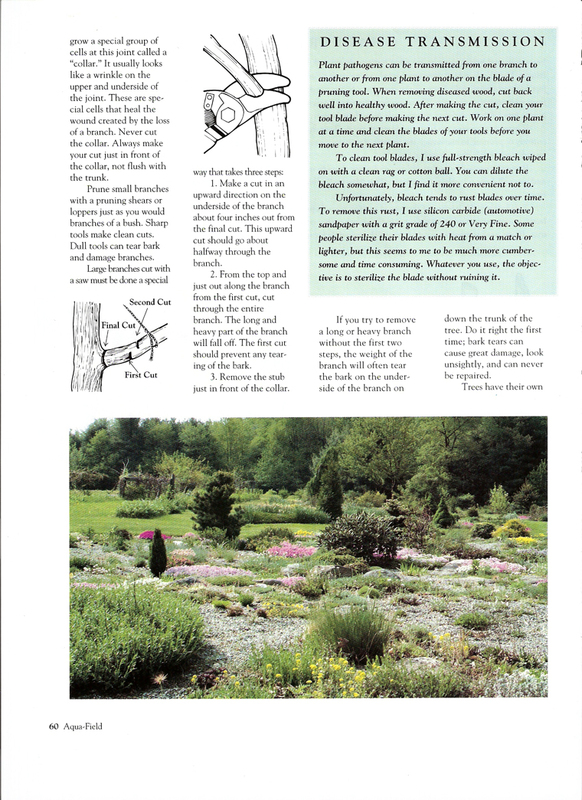 The Weekend Gardener Journal, May/June 1988. "Rhododendrons." 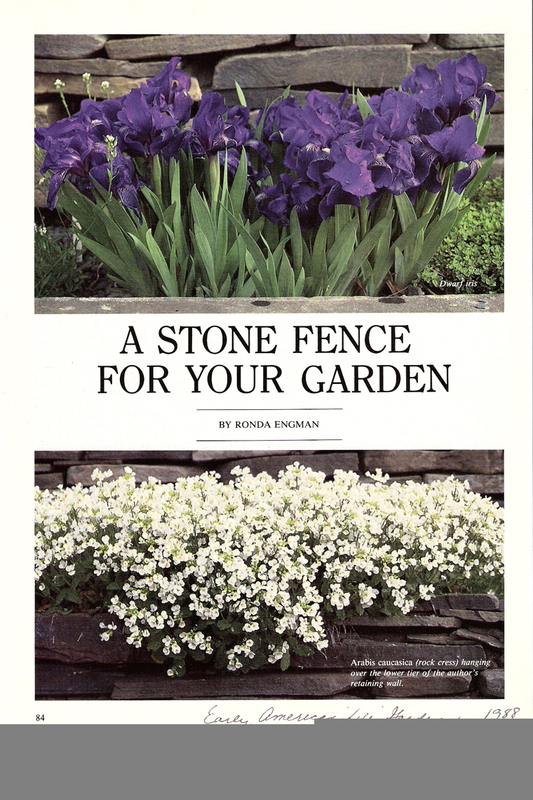 The Weekend Gardener Journal, May/June 1988. 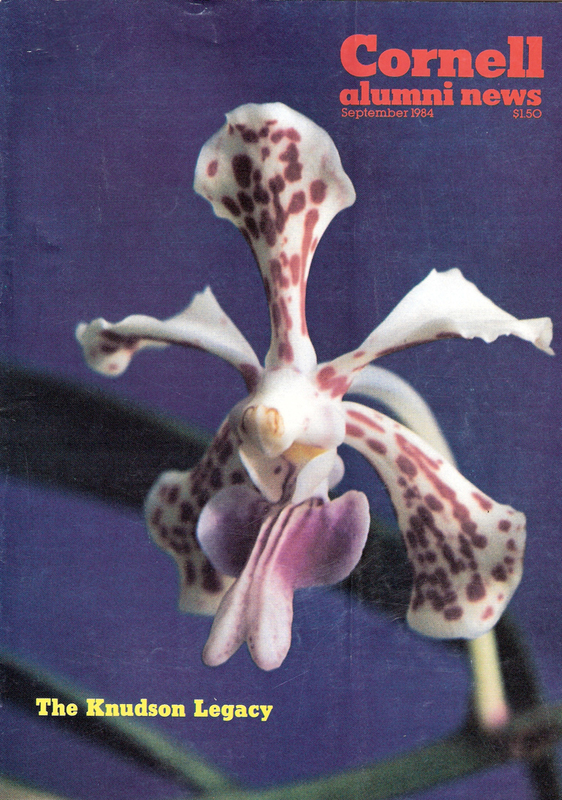 "Beauty of Orchids." 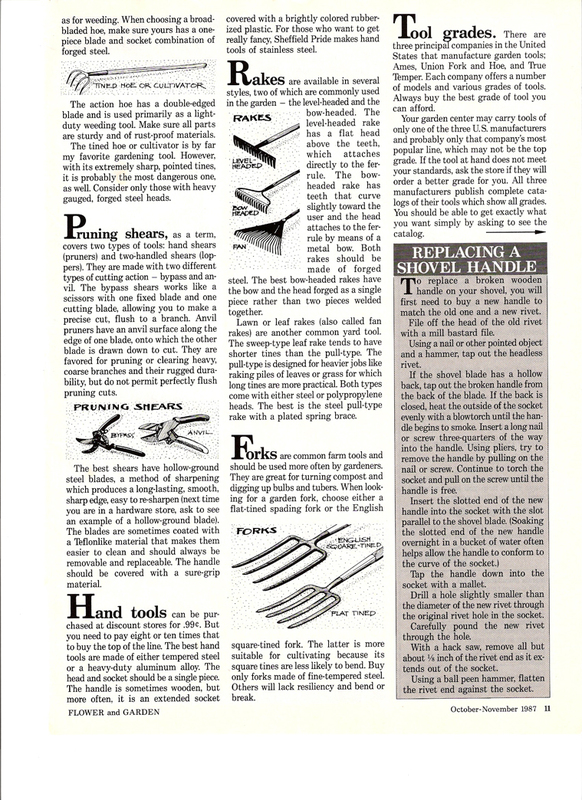 The Weekend Gardener Journal, March/April 1988. "Everlastings: Flowers That Bloom Year 'Round." 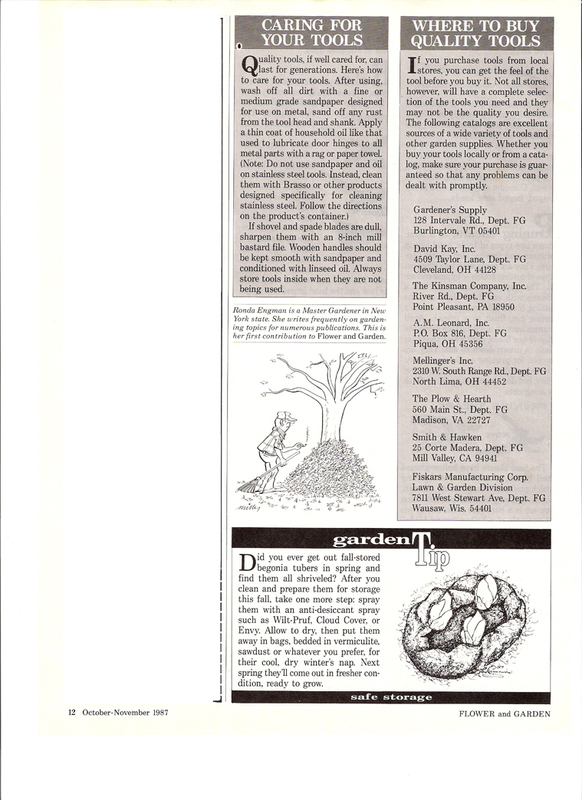 The Weekend Gardener Journal, January/February 1988. "Basil Any Way You Like It." 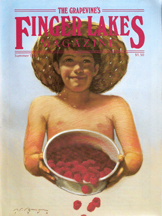 Finger Lakes Magazine, Winter 1987-88. 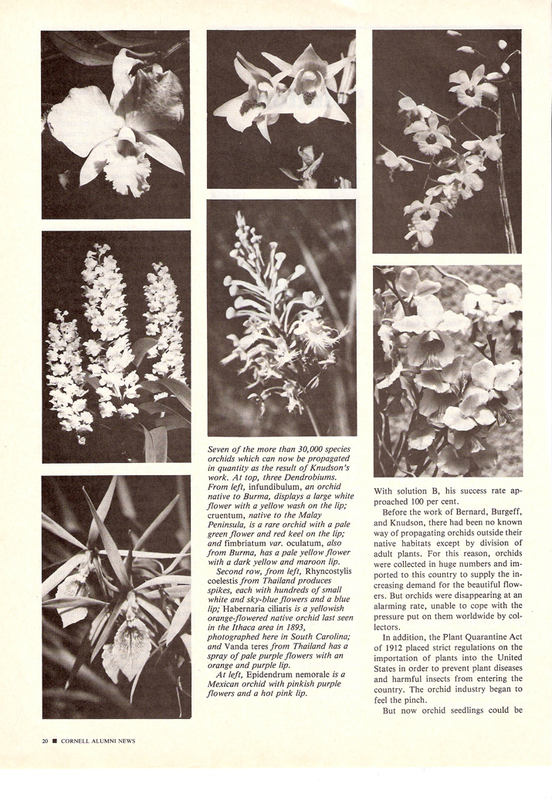 "Orchids, Orchids, Orchids." 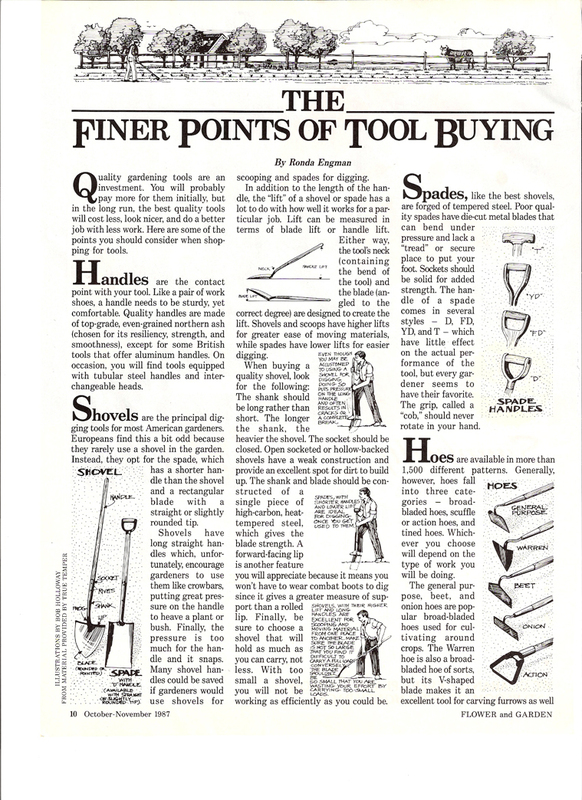 The Weekend Gardener, November/December 1987. 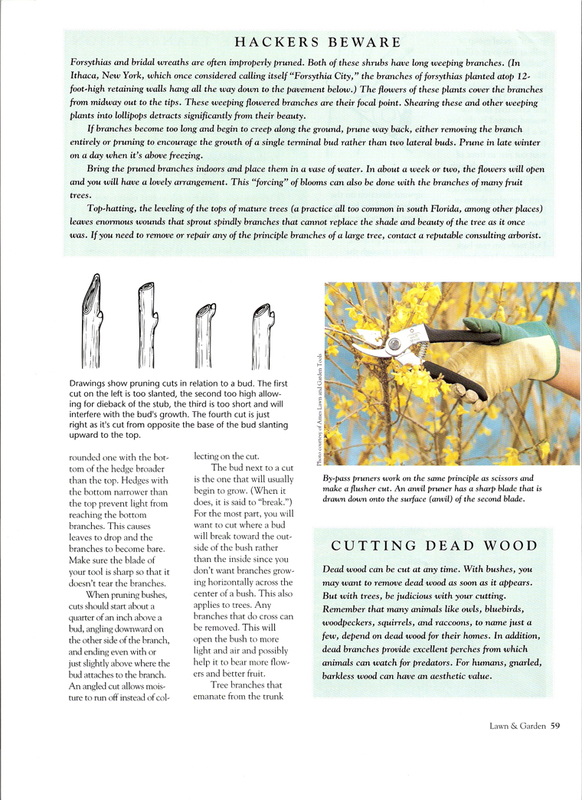 "Proper Pruning: Skill Through Experience." 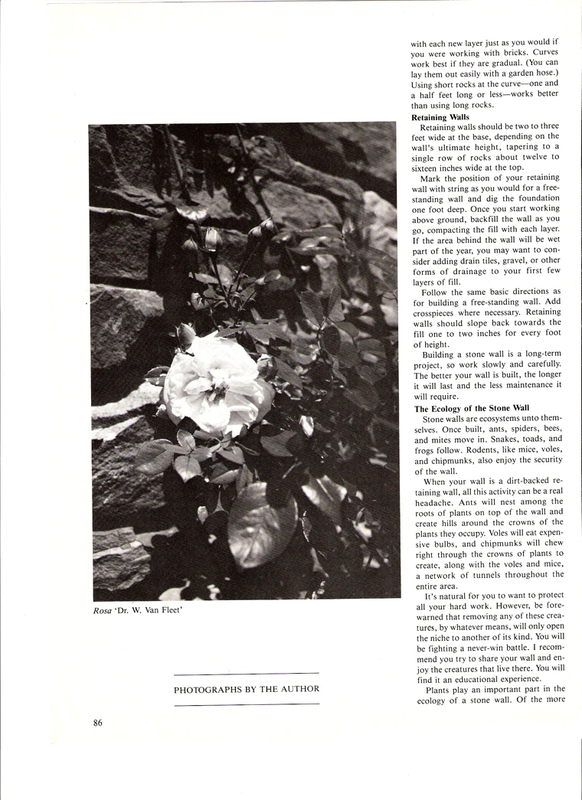 The Weekend Gardener Journal, July/August 1987. 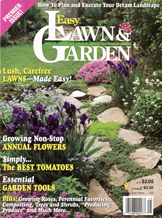 "Pamper the Plants." 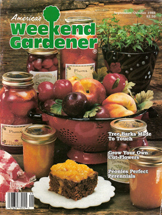 The Weekend Gardener Journal, January/February 1987. "Weekend Project: Build a Rock Wall." 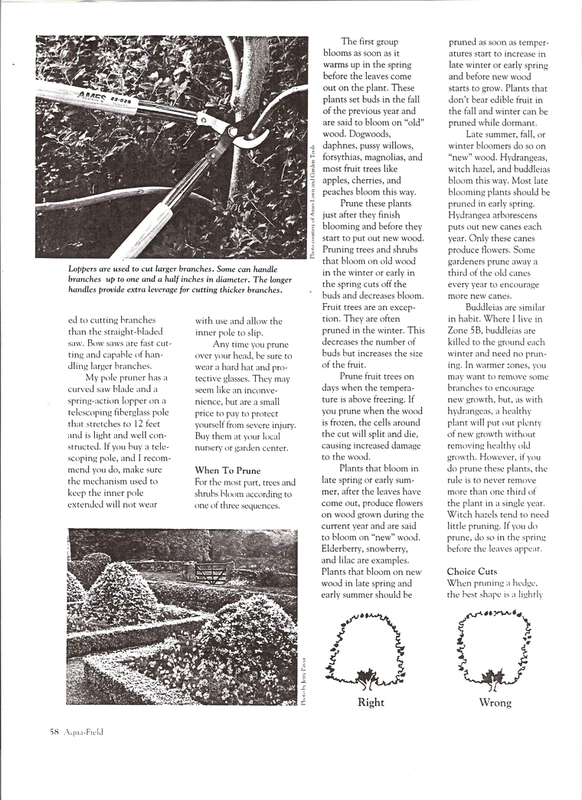 The Weekend Gardener Journal, November/December 1986. "Christmas Cactus." 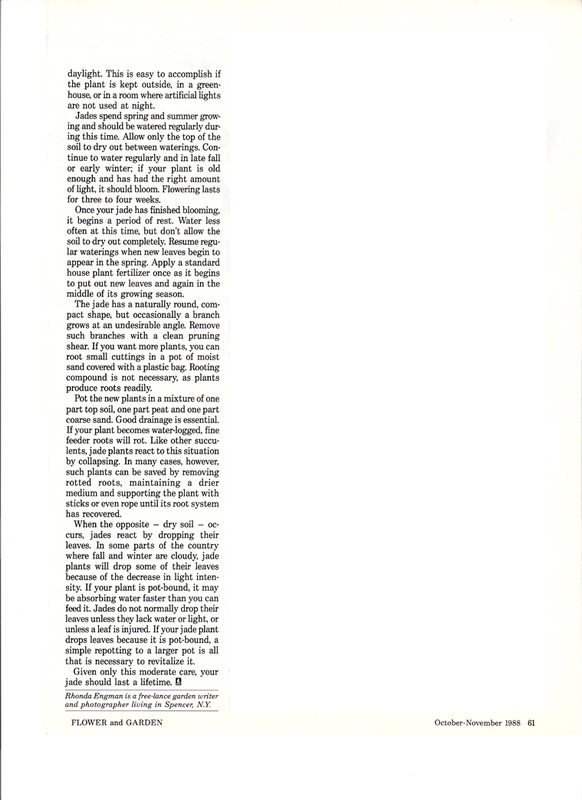 The Weekend Gardener Journal, September/October 1986. 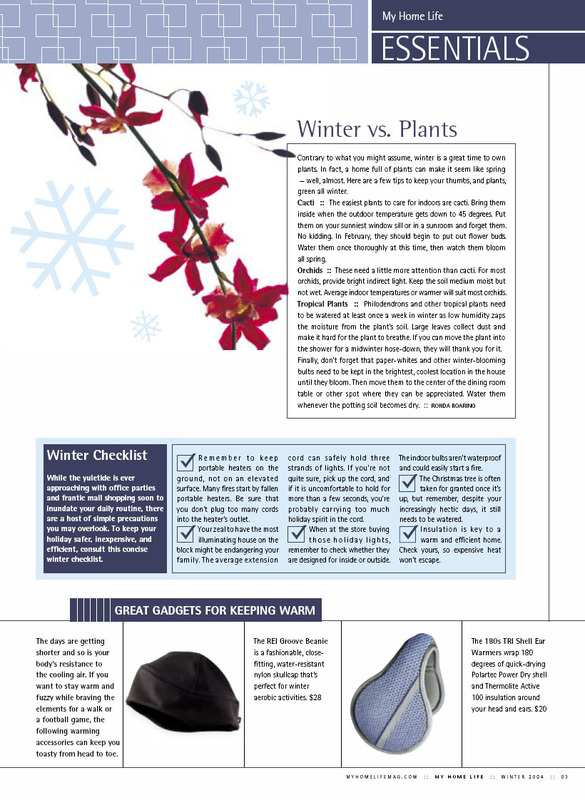 "Keeping Your Plants Warm In A Cold Frame." 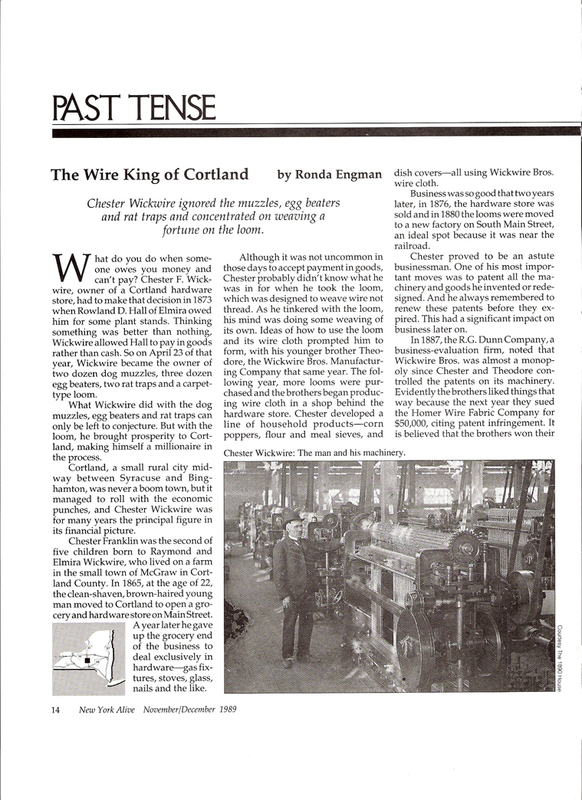 Grapevine, June 19-25, 1986. 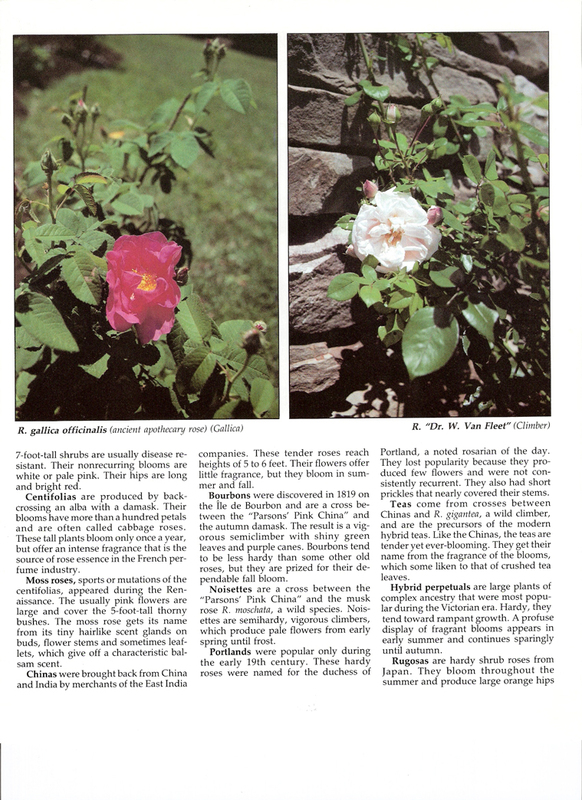 "Old Garden Roses." 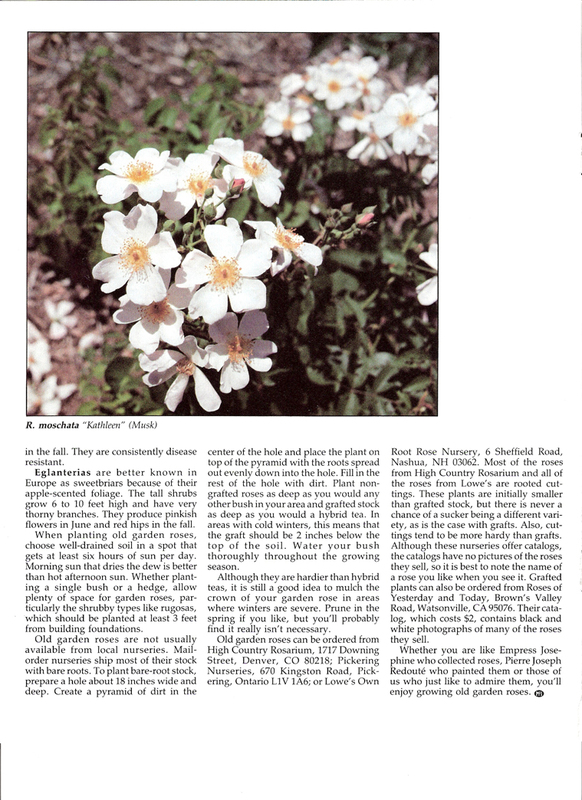 The Weekend Gardener Journal, May/June 1986. 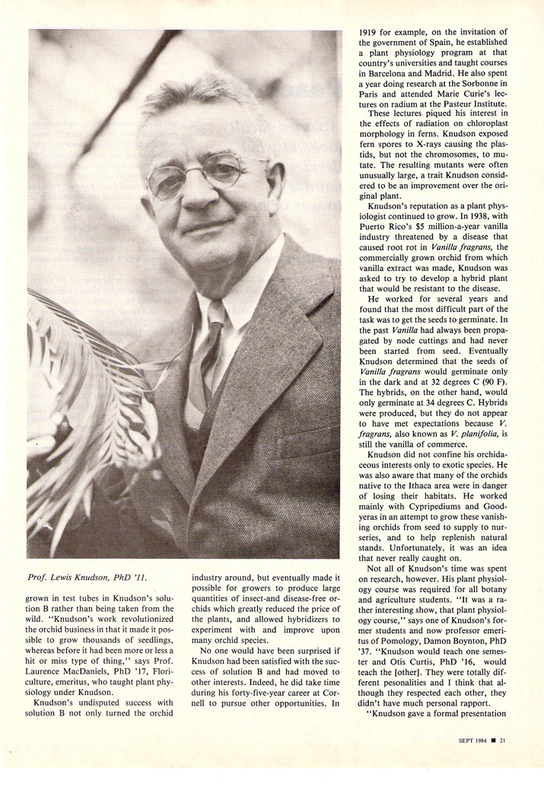 "Corn: Summer's Sweet Delight." 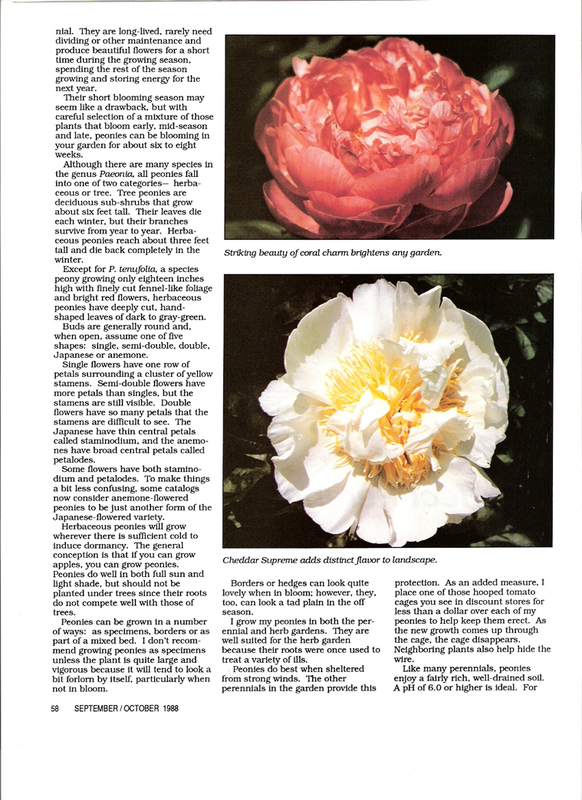 The Weekend Gardener Journal, September/October 1985. 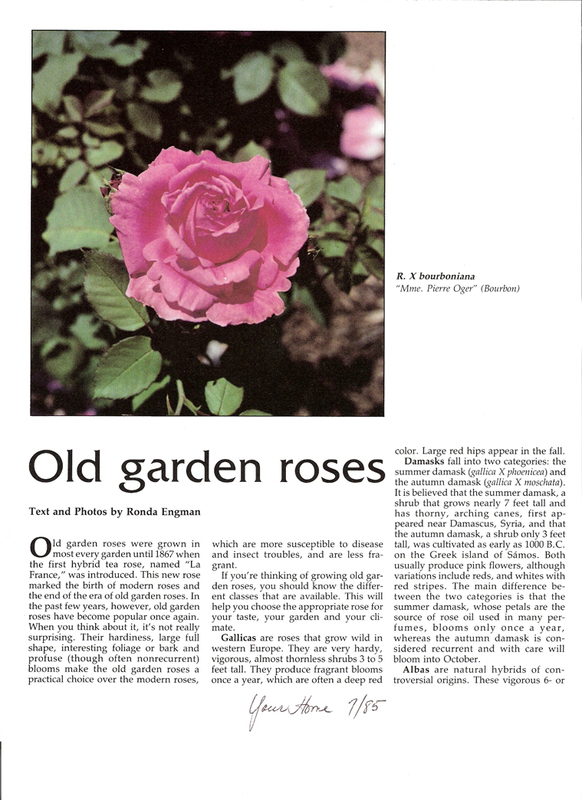 "Old Garden Roses." 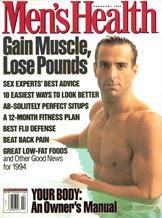 Men's Health, January/February 1994. "When Cold Bites Your Lips." A Better Life for You, 1983. "What To Do If Your Doctor Recommends Surgery." My Home Life, Winter 2004. "Unexpected Company--Is Your Pantry Ready?" My Home Life, Winter 2004. 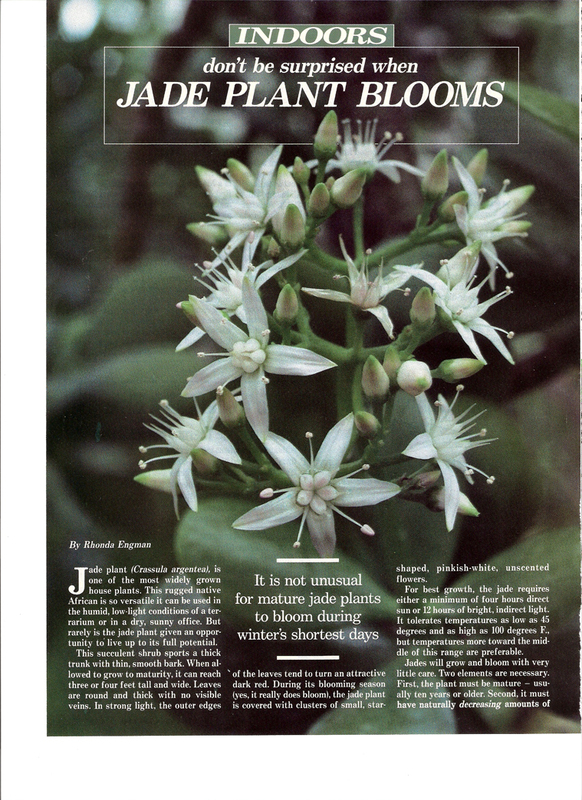 "Winter vs. Plants"
(Binghamton) Press & Sun-Bulletin, May 3, 1996. "Town to get new post offices." 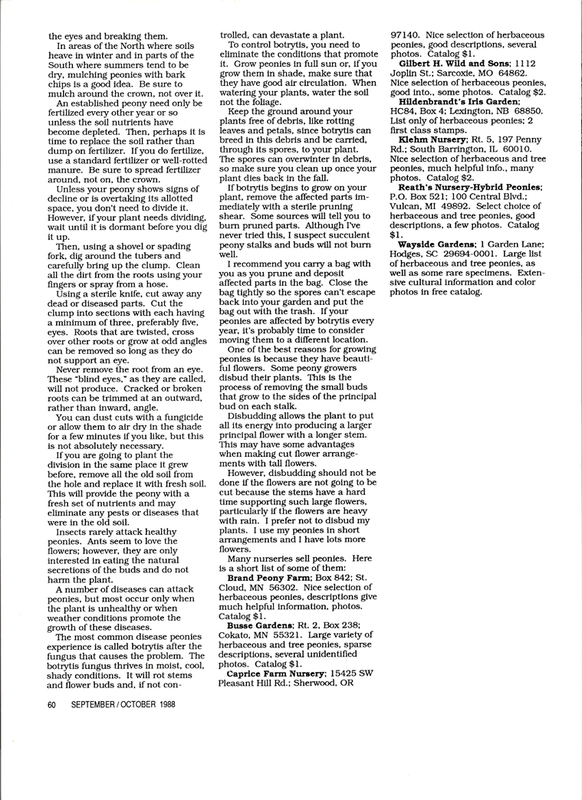 (Binghamton) Press & Sun-Bulletin, April 26, 1996. 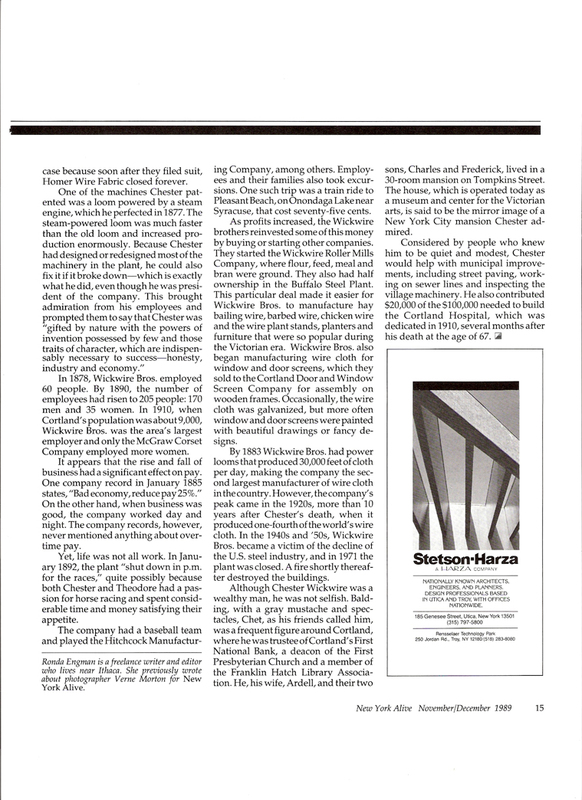 "Candor library gets computer with grant." 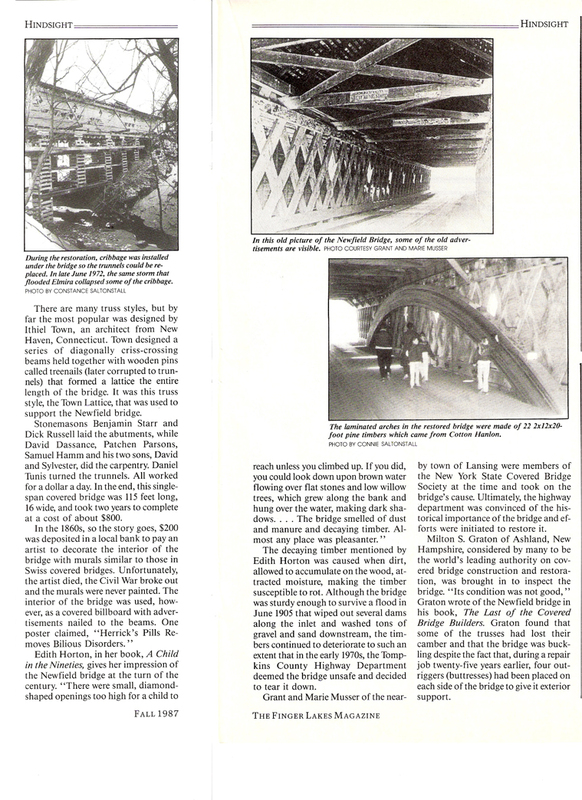 (Binghamton) Press & Sun-Bulletin, April 19, 1996. 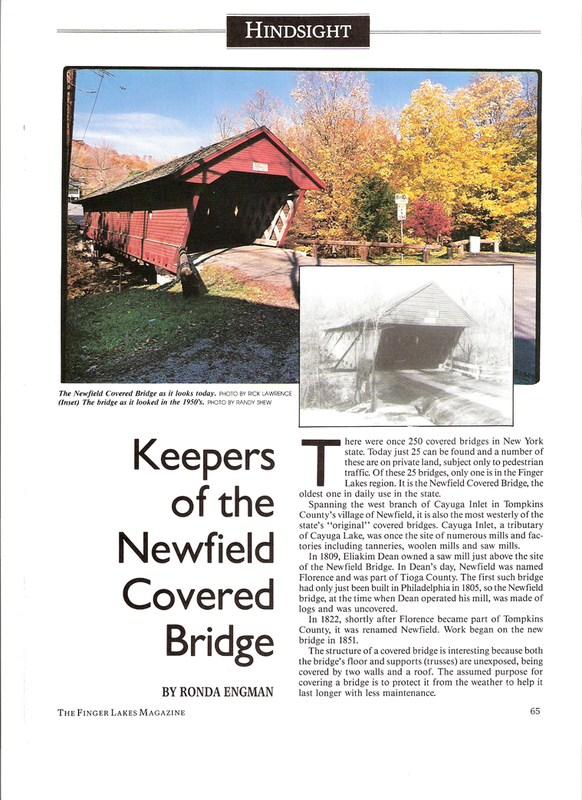 "Spencer landmark gets facelift." 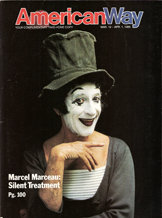 Connoisseur, May 1991. "Carousel Heaven." American Way, March 19, 1985. 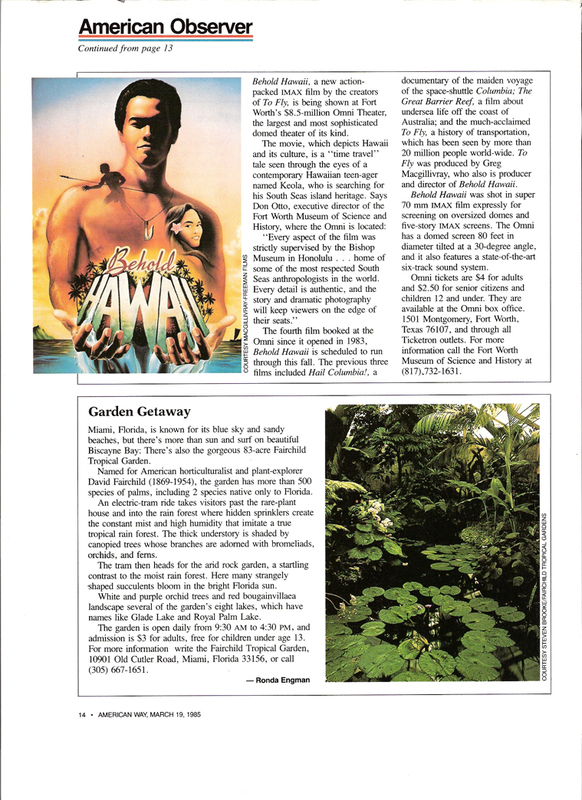 "Garden Getaway" (Fairchild Tropical Garden). 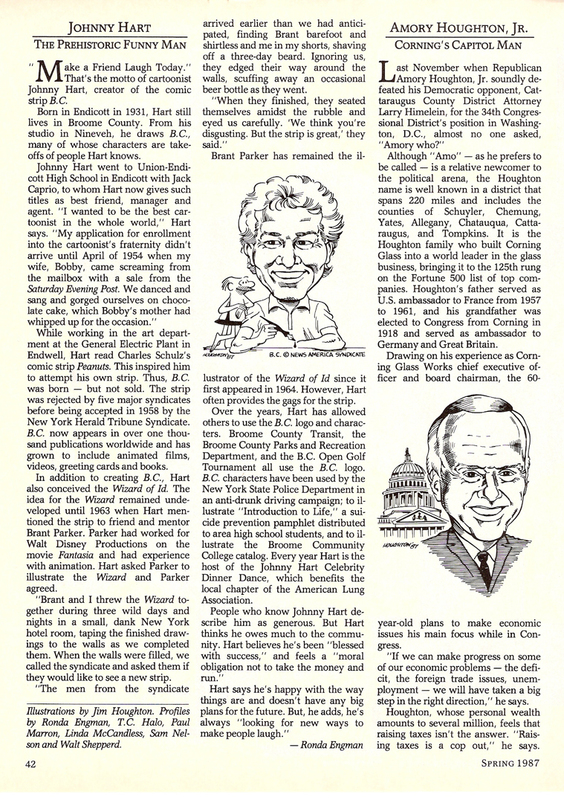 Cornell Alumni News, March 1984. "Women's Rights Park."